Some directors make it all look so... effortless. Hirokazu Koreeda is one such director. Almost allergic to pretension, his best films are so carefully considered and beautifully realised that they cannot fail to impress. I Wish is Koreeda's follow up to the director's acclaimed Still Walking (2008) and the as yet unreleased in the West Air Doll (2009). This latest effort is likely the most accessible film he has yet made, and it's also one of his best. Real-life brothers Koki Maeda and Ohshirô Maeda play Koichi and Ryunosuke - two young brothers separated as a result of their parents' marital difficulties. Quiet Koichi is living with his mother and grandparents in Kagoshima (adjacent to an erupting volcano spraying a fine layer of ash all over the town), while hyperactive Ryunosuke is with his musician father in the city of Fukuoka. Keeping in contact via phone, the brothers wish that their family could be brought back together. Meanwhile, their respective friends are also dealing with various trials and tribulations - from a girl dreaming of fame to the boys who have discovered their first crush in the form of the school librarian. The adults too have all manner of problems to deal with - from new romances to uncertain finances. When Koichi and his pals hear that a new shinkansen (bullet train) route is abot to open, they become convinced that the energy created by two trains passing by each other will be enough to make their various wishes come true. 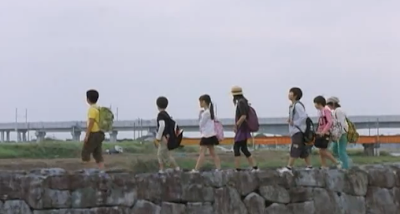 With a goal in mind, the two separate groups of schoolkids weasel their way out of class and past their guardians to embark on an epic trip to an elevated railway. I don't want to oversell this comparison too much because it's kind of ridiculous, but I Wish is sort of like a Japanese arthouse version of The Goonies. They both concern groups of kids dealing with the challenges of growing up and potential separation, and the characters in each conjure up a fantastical quest to make dreams come true. Of course, I Wish is much more naturalistic and reserved than the swashbuckling thrills of The Goonies, but they're both joyous celebrations of young imagination in the face of adversity. Koreeda has thread vaguely similar ground before, in the much darker, more sobering Nobody Knows (about very young brothers and sisters forced to fend for themselves when abandoned by their deadbeat mother). I Wish's comparative accessibility and lightheartedness, however, do not diminish the artistry and achievement of the work. The film does not, however, start particularly well. With a significant amount of characters to introduce, the film initially tells its story through a fractured structure that jumps geographically from scene to scene with only minimal warning. As it leaps back and forth between the relatively large cast of characters, it's easy to lose track of individuals' motivations and situations, or even whether you're in Kagoshima or Fukuoka. However, when the film settles and the characters are firmly established, the film bursts into life and commences to lay on the charm offensive. Resistance, I'm glad to say, is futile. The film's tone effortlessly segues between considered contemplation and adorable humour. This is a crowd-pleasing cinema in the most positive sense of the phrase. The kids turn in energetic, distinctive performances. Ohshirô Maeda is a standout, his cheeky grin infectiously cheery. A light but likeable soundtrack by Japanese group Quruli reinforces said cheeriness. This is a film full of great warmth and great humour. As the kids go about their lives and prepare for their epic roadtrip, they encounter people and situations that are both entertaining and insightful. Adult problems are constantly intruding in I Wish - and time is indeed dedicated to the older cast members, whose experiences act as intriguing contrasts with the kids - yet they're challenges to be overcome. Lessons are learned, yet the audience is trusted to decipher the film's emotional subtleties and thematic complexities for themselves. Koreeda has an enviable ability to make films that provide instant gratification while still rewarding deeper reflection. The director's Still Walking had the gall to directly channel Yasujiro Ozu, and amazingly succeeded in homaging the master while retaining an individual vision. I Wish is, similarly, either accidentally or purposefully indebted to Good Morning, and the comparison is again favourable. Like that film, it's absolutely unpretentious and completely charming. The visual style of I Wish is appropriately understated, and Koreeda extracts universally strong performance from his ensemble cast. The lives of these characters are tinged with disappointment, uncertainty and loneliness. Despite such bittersweet themes you will be hard-pressed not to leave I Wish smiling. 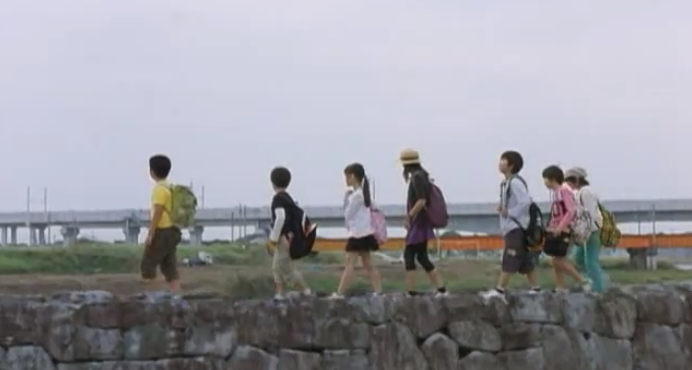 Seven children are encouraged to embark on an adventure and seek out their dreams, even if the outcomes are rarely easy. It's a simple story, simply told, and it is glorious filmmaking from a master director who makes it all look natural and effortless.